Crowns and Bridges – Yandina Dental. A crown is used to entirely cover or “cap” a damaged tooth for strength and improving its appearance, shape or alignment. 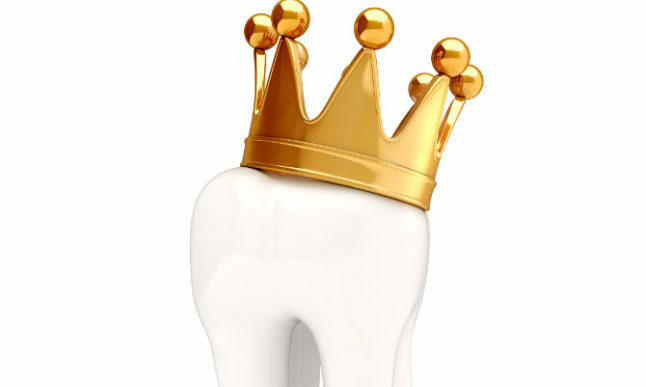 Crowns can also be placed on top of implants to provide a tooth-like shape and structure for function. 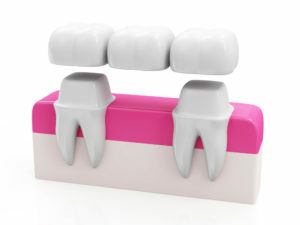 Porcelain or ceramic crowns can be matched to the colour of your natural teeth. This is why we recommend tooth whitening before placing a crown to achieve the best aesthetics. Gold crowns are excellent posteriorly as they are very strong and require less preparation of the tooth underneath. Porcelain bonded to metal crowns are often used as a compromise because they are both strong and attractive. A bridge may be recommended if you are missing one or more teeth, as they span the space where teeth are missing. Bridges are cemented to the natural teeth or implants surrounding the empty space. Gaps left by missing teeth eventually cause the remaining teeth to rotate or shift into the empty spaces, resulting in a bad bite. This imbalance can also lead to sensitivity of over-erupting opposing teeth, gum disease and temporomandibular joint (TMJ) disorders. Similar to crowns, you have a choice of materials for bridges. Your dentist can help you decide which to use, based on the location of the missing tooth (or teeth), its function, aesthetic considerations and cost. Your dentist will take firstly take an x-ray to check that there is no pathology present in the tooth, gum and bone areas. The tooth/teeth are numbed and an impression is taken. Then the tooth/teeth are prepared by reducing the size so that the final crown or bridge will fit over it properly. An impression is taken to provide an exact mould for the crown or bridge. Your dentist will take a shade if porcelain is going to be used as it is important to match the colour to your existing teeth. The impression is sent to the lab where they construct the crown/bridge. A temporary crown or bridge will be placed to cover the prepared tooth while the final crown or bridge is being made. When this is back from the lab, the temporary crown or bridge is removed, and the new crown or bridge is cemented over your prepared tooth or teeth. Crowns and bridges can last very well, but they must be looked after. The most important thing you can do is to practice excellent oral hygiene and attend regularly for checkups and professional cleans. A bridge can lose its support if the teeth or bone holding it in place are damaged by dental disease. Keep your gums and teeth healthy by brushing with fluoride toothpaste twice a day and flossing daily. Use a floss threader to clean under the bridge. If you get decay on the teeth supporting the bridge, chances are you will need a new bridge. So to minimise time and unnecessary expense, it is recommended you take very good care of your crowns and bridges. To prevent damage to your new crown or bridge, avoid chewing hard foods, ice or other hard objects as they can sometimes come loose or fall out over time. If you have a heavy bite, or grind or clench your teeth, your dentist may recommend you wear a night guard to lessen the effects of this. In severe cases, it is advised to see Dr Parker for muscle-relaxing injections in your chewing muscles to ease their function.